Visit the Kenda X-Fusion Booth #715 in the front row and see all the latest Kenda Legend of the Sport Tires and the New X-Fusion Shocks and Forks. Meet members of the Kenda X-Fusion Titus Race Team. Get a HansRey and Steve Peat Irish Pub Tour Poster. Get a cold Tab Energy drink or a Full Throttle Beverage. Or try Mighty Good Coffee. Or get a cold glass of special suds. Get information on the 24 Hours of Adrenalin events and Solo Championships. Check out the Kenda Demo Bike Fleet- bikes from Titus, Santa Cruz, Seven, Mongoose, GT, NORCO, Marin, Tomac, Nicolai, Haro, KHS and others will be available for test rides. Each bike is equipped with Kenda Legend of the Sport Tires. 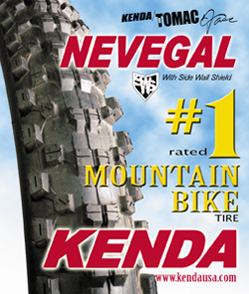 Buy a Kenda tire and we will install it on your bike. Scheduled appearances by John Tomac, Brian Lopes, Steve Peat, and other racing greats. Other unannounced specials at the Kenda Trailer- so stop by and check it out.